I'm taking a week off from talking about what we are doing to talk about how I schedule what we do and keep track of the week. I tell ya' the days are just flying by. Without my calendar sheets, I would not be able to remember what we did on any given day in specifics. Math? Spelling? Reading? Sure. What book did we read? Ummm. Let me get back to you on that. The days are cram packed and flying by, for sure. So the school week starts on Sunday night after the kids are in bed. Up to my room, I drag up my big ol' school binders and the teachers manual, a note pad, scratch paper, and my favorite pens. Then I dump all that on the bed and get comfy with some tea and while I print out my Motivated Mom calendar sheets for the week. What are those? Ohhhh. They are fantastic. You can find them here for downloading (sorry, not free - but not expensive either). I love the full page calendar, one page per day. I print 7-10 days at a time and clip them on a yellow folder. Something bright and cheery and easily spotted even on a cluttered counter . Yeah, it happens. Or if you are app happy, they have an app, too. Personally, I've tried to go paperless with the apps but it just doesn't work for me. I have this inborn need to make lists. With my favorite pens. mwuah ha ha. My hubby used to get so tired of all the little peices of paper lying around. One time he compiled them all into little digital note stickies. Yeah, those don't work for me either. But at least with my Motivated Mom calendars all (er... most) of my notes are all in ONE spot. Yes! Yeah, so rambly. Sorry. To the point already! So there I am surrounded by books, with the cat trying to take up real estate on every peice of paper around me. Ahhh. Brings me back to our college days together. I start with the menu plan for the week and thus the grocery list. Working backwards works for me. Dinner time is crucial so that's a good place to start. No plan for dinner means cranky peeps and late bed times which just percipitates to more crankiness. I'm grain free and sugar free, one kid is potato free and mostly grain free, and another kid is all kinds of free. So no easy way out take out around here. Must. Plan. the meals. And the grocery day. Second thing to do is to check the calendar for appointments. I am notorious for missing appointments. le sigh. I'm getting better, though, so bare with me. I add those appointments onto my calendar pages in black ink on the left of the day planner section. 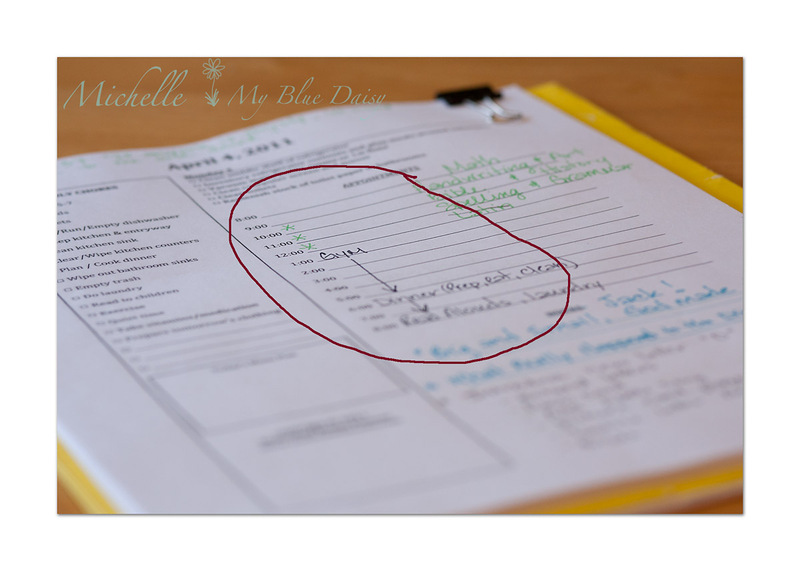 There is even a handy dandy spot on these calendar pages to put your menu plan for the day. Nice, yes? Next on the list is school work. I sit down with each curriculum we are using (My Father's World Adventures and Kindergarten) and go through the plan for the week. For my third grader, I list out her daily plan on the upper right corner of the day planner area. Don't pay any attention to the times you see in the picture. We rarely, ok never, start school at 8 AM even though Math is always listed at 8 AM. Bare with me. This is an example of taking something and making it work for you. And I love that! These are written out in my green favorite pen - which is totally different from my black favorite pen. Color coding. Yep, color coding is essential if you are schooling more than one child. I don't list out specifics, just a general list. Sadly, if I don't list out grammer, I will forget it that day. The teachers manual has a nice grid with all the specifics, but it's also a little overwhelming to me. So this calendar plan is just a general check off list that I can use for quick reference. My day is FULL of interruptions. When we start our house rescue routine before dinner, I need a quick reference to make sure we covered all the important things in the day. So even though listing all these things out is redundant (it's in the teacher's manual) I have found it to be key to accomplishment. I use the bottom section of the Motivated Moms calendar to list out Little Man's daily school plan for kindergarten - in blue pen. Which reminds me, I need a new blue pen. Some small hands have mussed up the felt tip and it was bleeding all over the page this week. Thus you will see that his plan is not all in blue this time. Below is Monday's plan. 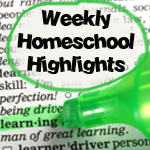 Once we are focused on school for the day, it's easy to forget about the house chores. Right up until you walk into the kitchen and step on something with your bare feet. Ick. Love, love, love having my school plans, my calendar, and my chore lists all on the same page. The left side of the Motivated Moms calendar sheets is a running list of daily chores - those things you should do every single day. (Ha ha ha!) Stay with me here. The crazy thing is that when I do most of those every day, my house stays fairly clean even though the children are actually HOME with me ALL day long. It's like living in the middle of a tornado around here. Here is what a typical Tuesday looks like. I never schedule appointments or outings on Tuesdays, except when it's our turn to drive down the the farm to pick up milk, eggs, and meat. See the house rescue? That's where I run crazy through the house picking up clothes, throwing toys, vacuuming, and yelling at the kids - usually something like "Hurry up and clean before Daddy sees what we did to the house! When did you make that mess? Are you kidding me? Ahhh!" 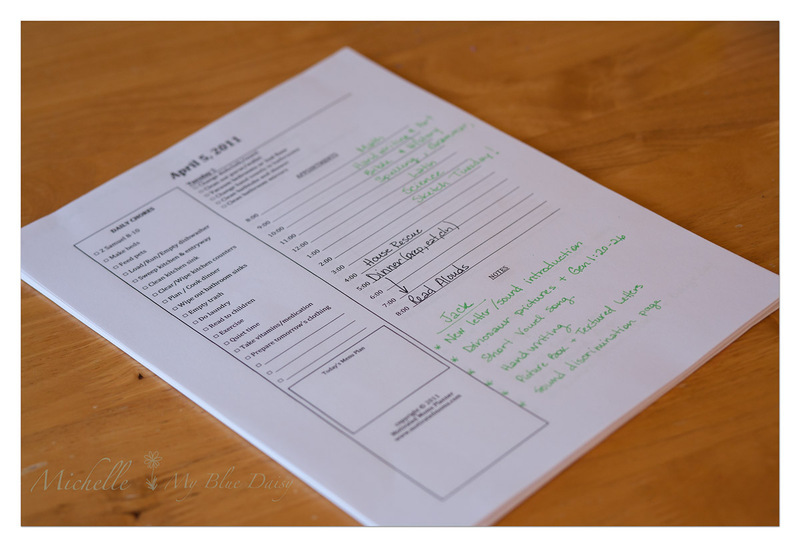 The top list on the page are the extra chores for each day. Now if you can do these, plus the daily chores, and get to all appointmens and finish school, well then you are a Saint living on Red Bull. And I'll probably stare at you in bug-eyed amazement if we ever meet up. Short of that, I call myself accomplished if I manage to check off 75% off the items on my daily sheet. Thursday is the day I catch up on anything I'm behind on around the house. Friday is the day I catch up on anything we might be behind on in school. 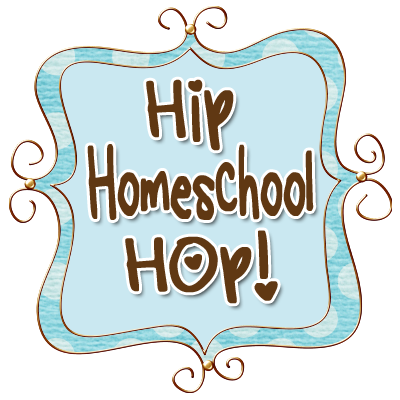 This post is linked up with several other My Father's World Homeschool families. You can find them all here. It's always neat to see what others are accomplishing on their journey. BTW - most of the other families have great pictures and recommended books. 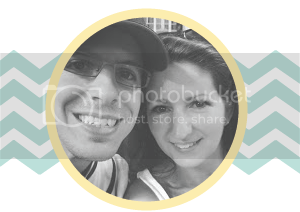 Love their blogs! P.S. That was a way long post. Wow! Thanks for reading. LOL Next week I'll write about how we go through the day schooling 3 kids of different ages. 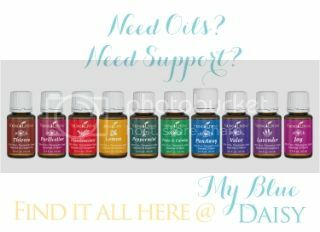 Absolutely AMAZING post! Thank you so much for taking a break and sharing this...have to get our day going...but I'll be back to study! I've used Motivated Moms for 2 yrs, but didn't buy it this yr. Now, I'll be going back! I love that! 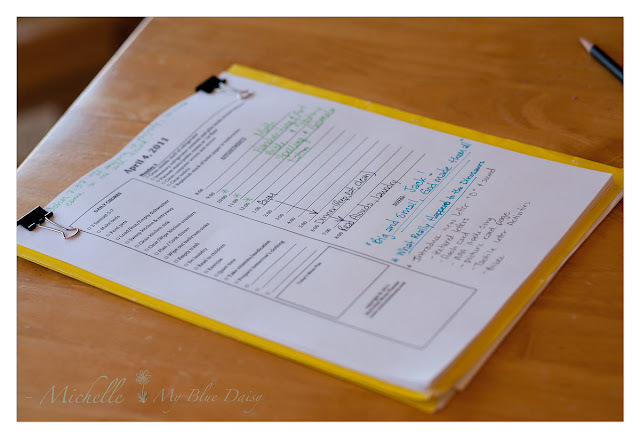 I am an organizer, I have a note book with lots of pretty forms.... but I have been struggling for a while just not having it all on one form in one place. Thanks for sharing. I am going to give it a try. Great tips on organization! I'm in that "list-maker" club too and it would be great if I was organized and could find my lists when after I make them! I need paper too! I love this and thanks for the links.